William K. Harvey was the CIA's most daring and successful field operator during the tense, early days of the Cold War. Extremely intelligent, a dedicated martini drinker, coarse in manner and appearance, both loved and hated, he was larger than life. William K. Harvey was the CIA's most daring and successful field operator during the tense, early days of the Cold War. Extremely intelligent, a dedicated martini drinker, coarse in manner and appearance, both loved and hated, he was larger than life. But just as Harvey reached his zenith, fate and personal flaws caused his swift, dramatic downfall. Bayard Stockton provides a rich portrait of the man, including accounts from Harvey's family, friends, and former CIA colleagues who have never spoken publicly before. Harvey's intelligence career began at the FBI, where he hunted Nazi spies. After running afoul of J. Edgar Hoover, Harvey went to the fledgling CIA in 1947. Harvey's CIA successes included the unmasking of Soviet spy Kim Philby and masterminding the famous Berlin Tunnel that tapped Russian communications. The pinnacle of Harvey's career came as chief of both ZR/RIFLE, the agency's political assassination operation, and Task Force W, the group targeted on Cuba. But Harvey was in constant conflict with Bobby Kennedy, who micromanaged operations against Fidel Castro. Harvey profanely insulted the president's brother during a tense meeting, which led to Harvey's reassignment to Rome. His alcoholism worsened in Italian exile, and he was forced to retire. He became a nonperson. However, Harvey resurfaced during Senate hearings in the 1970s. When his supervision of the plots to assassinate Castro was revealed, many labeled Harvey the epitome of CIA excess. Harvey's continuing friendship with Johnny Rosselli, a Mafia figure who had helped the CIA with Cuban operations, opened further questions as some—most notably Robert Blakey, former chief counsel to the House Subcommittee on Assassinations—linked Rosselli to JFK's assassination. 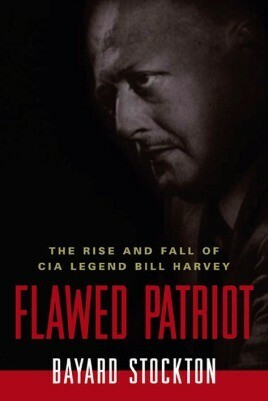 Flawed Patriot cuts through the rumors and inaccuracies surrounding Harvey to show a brilliant but flawed man who was undoubtedly one of the most talented and imaginative officers in the agency's storied history.